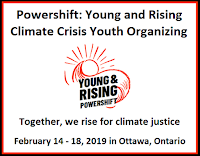 Powershift: Young and Rising — Climate Crisis Youth Organizing will take place starting on February 14th and conclude on Monday February 18, 2019. It will take place in Ottawa, on the land of the on the land of the Algonquin, Haudenosaunee, Huron-Wendat, and Anishinabek. At this event hundreds of young people will converge to build a powerful and intersectional youth climate justice movement. They will affirm that they are the generation that has the power to counter the damage done, and build the future we know is possible. 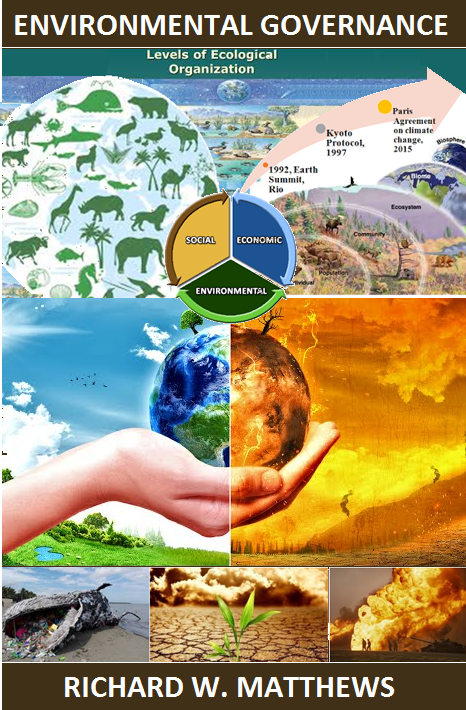 This four day youth climate convergence that will feature workshops, keynote speakers, performances and panel discussions on how the collective youth movement can take action to solve the climate crisis. Be prepared to learn about the history of social movements; how to start a campaign from scratch; how to influence decision makers; and how Canada can transition to a renewable energy economy. They will dig deep into discussions on topics including fracking, pipeline politics, Indigenous sovereignty, divestment, and green jobs. Participants will learn how to make lasting change through community organizing, direct action, art, storytelling, and using traditional and digital media. Through workshops and skill-building sessions, participants will learn from peers, elders, and experts alike. They will forge the bonds needed to solidify a long-lasting, resolute, and intersectional climate movement that can transition us away from fossil fuels to a renewable energy economy. 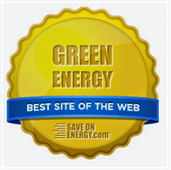 PowerShift has historically been a series of gatherings organized by youth for youth. PowerShift gatherings mobilize passionate young people from many walks of life to explore ways of taking action to confront the climate crisis. PowerShift is about youth learning from each other, learning together, and using that knowledge to develop common strategies for creating visionary change. 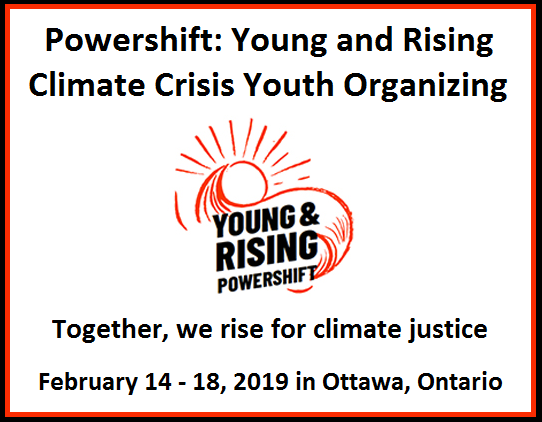 PowerShift aims to ensure that once the convergence is over, the youth climate movement continues to grow through our networks, continued capacity building, and strategic action. 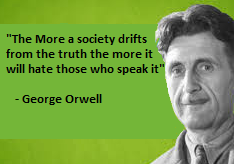 As wildfires burn through BC, glaciers retreat in Alberta, winters grow shorter in Nunavut, and floods destroy homes in the Maritimes, Canadian politicians continue to fail us. The federal government touts a lacklustre climate plan, all the while purchasing pipelines, protecting big industry, and failing to respect Indigenous rights. In the face of climate catastrophe, we see young people from across this land coming together, time and again, to work for the just and livable future we know is possible. Powershift: Young and Rising will galvanize a new wave of young leaders to assert a vision beyond fossil fuels- one that honours the leadership that frontline and Indigenous communities have been taking for generations. In this moment, the stories and actions of young people are more necessary than ever before. The youth are part of the generation that has the power to counter the damage done, and build the future we know is possible.